A friend of mine took a career break & decided to explore northern Europe. First on the list – beautiful Iceland. I would like to share her experiences & some amazing pictures with you guys. I’m hoping one day I can follow her footsteps to collect my own exciting memories, pictures & relax from the busy big city life. Welcome to the land of Vikings, Elves & Trolls. The part of the world with the most beautiful country scenery, where humans live in symbiosis with the nature. Welcome to Iceland. 31.8-3.9 – Reykjavik: craft beer pubs & getting ready for the hike. 2.9 – Group trip to the Golden Circle: Geyser & an amazing waterfall Gulfoss. Thingvellir national park & the Secret Lagoon. 4-8.9 – Laugavegur track: one of the most beautiful hikes in the world. Sleeping in huts with quite a few fellow hikers was one hell of an experience. Some cabins don’t have showers. Everything is strictly environmental. Electricity is generated from the solar power. 10.9 – Morning bus to Jökulsárlón (6h trip) to see floating Glaciers. Tonnes of tourists everywhere, even outside the season. Sneak pick & booking www.icelagoon.is. 11.9 – Visiting my mate, a drive along the South coast (Skaftafell, Vik) to the West. 13.9 – West coast: Snaefellsness Peninsula – golden beaches, black basalt cliffs, tiny little towns. 15.9 – Bus – ferry – bus to the West Fjords. Driving around by car & bike, thermal pools, food, food & more food. 18.9 – Flight back to Reykjavik & then home sweet home, back to the Czech republic. Reykjavik – the Harpa concert hall – interior. Shopping. Iceland isn’t a shopaholic paradise for sure. Choice between an expensive Icelandic brands (66-north) OR a very limited selection in Next would hardly satisfy fashion lovers. What I found refreshing is, that there are hardly any international fast food chains such as McDonald’s or Burger King. There are only a few KFC’s (mostly in the suburbs), or their local food chains. Subway arrived to Iceland not long ago. Cardigans with Nordic pattern seemed to be a very popular outfit. They are insanely expensive around 20-30,000 kronas (£100-£150), yet everyone wears them all the time. The sweaters are probably incredible in prevention against cold & wind but they are so itchy, I wouldn’t survive an hour in one of those. Nevertheless, they make guys look super HOT. I was too shy to take their picture (HAHA), but they do look exactly like as on this advert, believe me. Very expensive coffee from 400-600 kronas (£2-£3). Not to mention that most of the time you get a half empty cup. In the small towns, it’s hard to get anything else but a coffee from the machine for almost the same price. Laugmannalaugar, South Iceland – start of the Laugavegur track. 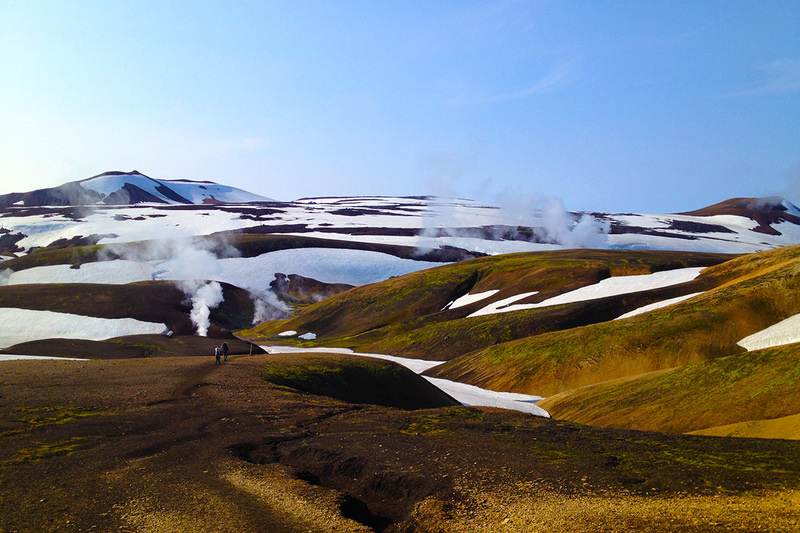 Laugmannalaugar, South Iceland – start of the Laugavegur track, the camp ground. Laugmannalaugar, South Iceland – start of the Laugavegur track at 6am. What about the everyday life? “Reykjavik’s notorious nightlife lasts until early morning. Outside the season all towns are dead (Reykjavik is the only exception), where all the people are & what the do all days, that’s a mystery to me. Laugmannalaugar > Hrafntinnusker – 12km, the perfect weather. How easy is to travel around the Iceland? “Each family has a 4WD. I would say it’s quite a necessity here. Tires can be blown into monstrous proportions, but it’s not a fashionable thing (well, mostly not… some people just have to show off), many roads are simply impossible to access with ‚normal‘cars. Getting to the middle of Iceland without a terrain vehicle, (even in the summer) is unthought of. As for the public transport in Iceland, there are a few bus companies that operate around the island. They’re mostly privately owned. Strætó is the public\cheapest one. They use dozens little tickets, each valid for a limited period of time. They are then exchanged for the actual travel ticket when you board the bus. So you end-up walking around with your pockets full of small papers, which are collected by the driver… really weird system. A six-hour trip by bus for 10,500 kronas (£52.5), quite expensive, I would say! BTW they don’t have any trains there. Jökulsárlón – SouthEast Iceland – floating glaciers. The most important question – How was the food? Skyr – something like a yogurt, same taste as thick Greek yogurt, but contains NO FAT. Lamb – they eat all kinds of meals with lamb. Even the lamb head is on the menu. Rhubarb is one of the few plants that withstand the climate, so it’s a very popular ingredient :). Rye bread – their speciality is to make it a bit sweetish. Often it’s cooked in the ground heated by the hot thermal steams. It’s buried in the ground, in the evening & ready by the morning. What a great idea… please don’t try that at home (burying strudel under the hot water pipes :D ). Fish – Dried fish with butter is a favourite snack. Lobster soup – Delicious soup. Snæfellsnes peninsula, Western Iceland – Arnastapi. Dynjandi (Fjallfoss) – the biggest waterfall in the West Fjords. “Their cities are more like a super small villages to us Europeans. Some of the villages have only one house & church. Surprisingly there is a church in every single village, even there are only 4% of Catholics among Icelanders. Water (especially hot) from the tap, stinks after sulfur. At first I thought it was a smell from the toilet, then someone explained to me – they pump water from the thermal steams, obviously as they are everywhere. It’s quite hard to drink, but I did get used to it. Icelanders claim they don’t smell the stink at all :) An amazing human ability to adapt ain’t? Thanks to the incredible sceneries that Iceland has to offer, a lot of famous movies were filmed here – Lara Croft, James Bond, Game of Thrones, etc. Because of the scenery, NASA have their astronaut training station in the middle of Iceland. The hospitality industry relies mostly on local products. Most hotels & restaurants bake their own bread, and grow fruits & vegetables in greenhouses. They’d have their own sheep & prepare the meat in their own kitchens. Alternatively buying from a neighbour. Good old lifestyle & symbiosis among all people. Hired a bike in Ísafjörður and road to Bolungarvik. Bolungarvik – Ósvör Museum of fishing. West Fjords – Þingeyri – the fishing village. What about amazing Iceland nature? “Unpredictable weather – extremes from nice & sunny to fog, rain or freezing wind. Because of the constant weather changes the rainbows are everywhere & all the time. In certain areas (i.e. arend Laugmannalaugar), there is no vegetation! There’s even a joke on that: If you get lost in the forest, what should you do? STAND UP! :D There’s only moss everywhere. Most amazing feature – NO mosquitoes. Never were, never will be! A-M-A-Z-I-N-G.
From Álftavatn to Emstrur – 16 km. Snæfellsnes peninsula, Western Iceland – the Öndverðarnes beach. Hallgrímskirkja with Leifur Eiriksson’s statue (An explorer considered by some as the first European to land in North America, before Christopher Columbus). Breads are being made under the little piles of soil… baked by the hot steams. A quick lunch anyone? Sheep’s head & mash potatoes, in the supermarket. How are you supposed to remember these names?? Iceland has a concentrated tourist season, peaking from mid-June through August. But Iceland also offers plenty to do in spring, fall & winter. Big advantage is that prices are dramatically lower for airfares, car rentals & accommodations. Take your pick & enjoy this beautiful country. All pictures above are from Pavla, taken with iPhone4S & some old Lumix.